"I don’t think there is discrimination against Israel at the United Nations," says UN chief, days after saying the exact opposite. United Nations Secretary General Ban Ki-moon has apparently forgotten his admission last week that the organization he heads is biased against Israel. During his visit to Israel last week, Ban told students that “Unfortunately, because of the Israeli-Palestinian conflict, Israel has been weighed down by criticism and suffered from bias and sometimes even discrimination”. 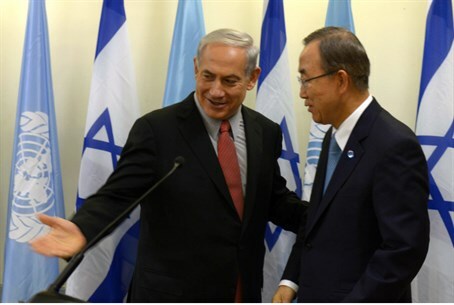 Ban said told the students that Israel should be treated equal to all the other 192 UN member states. The comments came in response to complaints by the students that Israel receives more criticism than any other member country in the world body. On Monday, however, while speaking to journalists, Ban was asked by an Israel Radio reporter regarding his earlier statements. The Secretary General at first spoke about the incitement against Israel in UN funded camps in Gaza, which Prime Minister Binyamin Netanyahu had presented him with during their meeting, saying they would be investigated. Ban added that "incitement against any group of people or any religion or tradition and disrespect against any traditions and region and people, ethnic group is unacceptable."